Sisters Donna, Kim, Christine and Joni – at Center Perk in downtown Manchester, Connecticut. Downtown Manchester, Connecticut has gotten perkier in recent months. 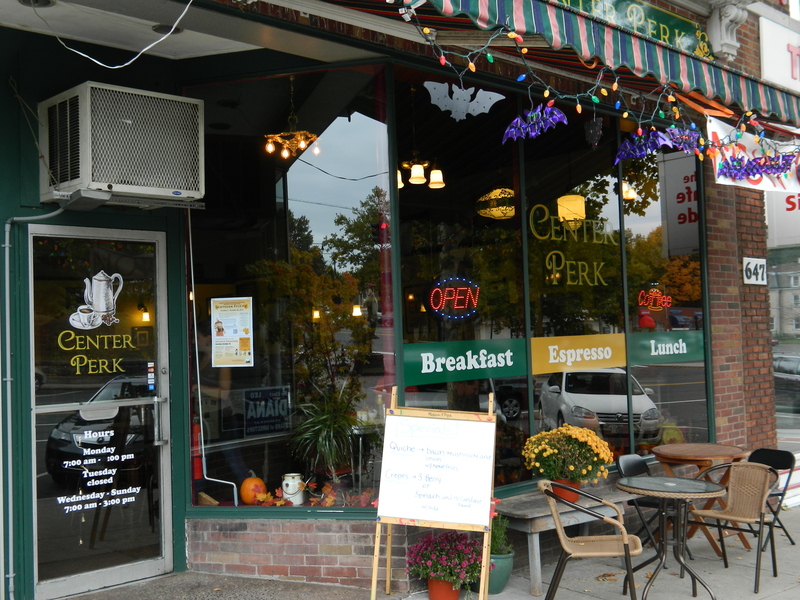 On June 6th, sisters Kim Barnett and Christine Bedrossian opened Center Perk, a breakfast and lunch restaurant on 639 Main Street just across from Center Memorial Park. They are running it with help from two more sisters Donna and Kim, as well as, a cadre of other family members. “There are eight siblings, six girls and two boys. We’re from Manchester, so when we decided to do this we decided we wanted to do it here,” said Kim during an October 13 interview. Kim shows a photo of her father who served as a gunner in WWII. Kim had tried a similar venture in Glastonbury but it did not pan out. Having her sister as a partner made the idea of trying again palatable – no pun intended. Before opening the restaurant one sister had been out of work and the other was unhappy in her previous position. They both love to cook, so they began looking for a spot. It felt right when they came across this space; here, they managed to fit a full length mirror that once belonged to their great-grandparents. 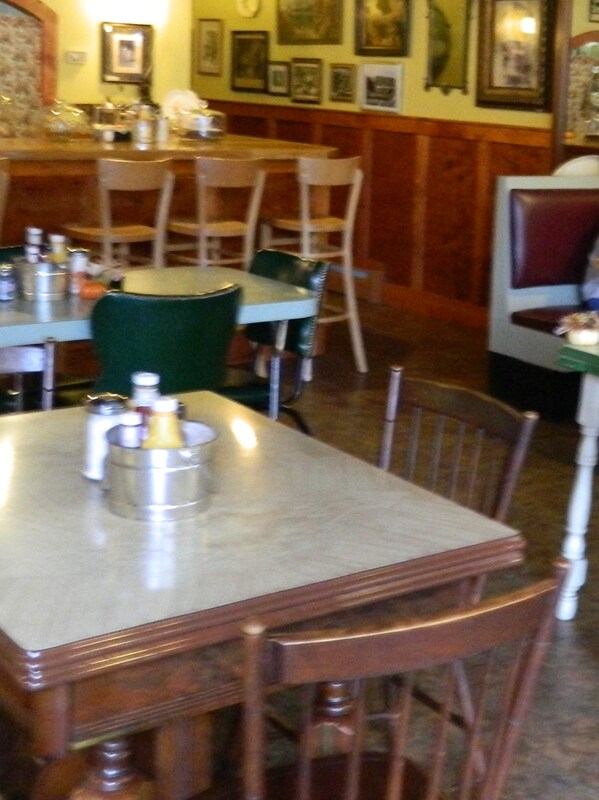 In fact, the ‘back in the day’ feel inside is quite intentional with cozy booths and some tables and chairs donated and others that came right from Christine’s Victorian style home. “I wanted it to have a Victorian feel,” she said. A few seats with a view of the downtown are set up outside. 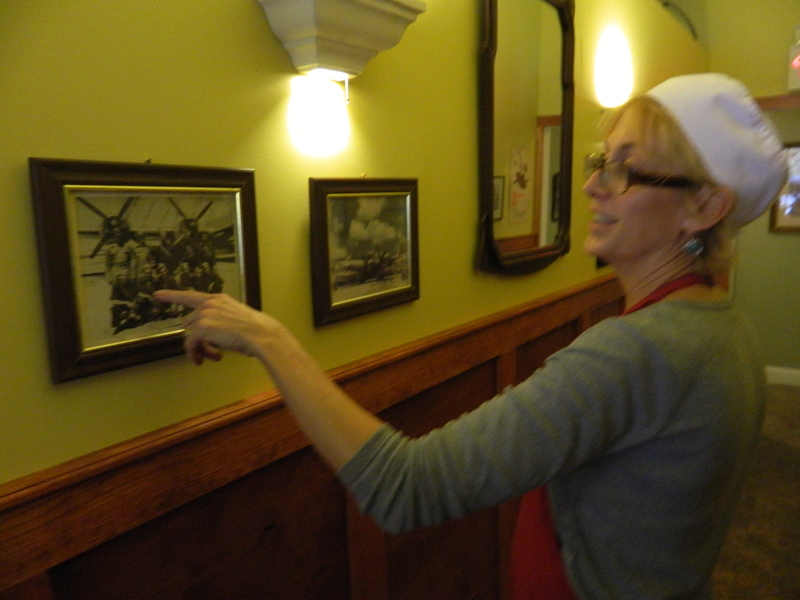 Scenes of old Manchester and family photos grace the interior walls. A special picture of their parents hangs just behind the front, high-chaired counter, and there are more photos , some heralding the service of their father who was as a gunner in World War II. So far say the sisters, business has been very good. “Especially on the weekends, we’re very busy,” noted Kiim. It’s easy to understand why. Food is locally supplied and the restaurant motto is “cooked with care, from our family to yours.” In addition to offering a reasonably priced and extensive menu of Sweet Morning Omelets, sides such as grits, sweet potato home fries and corned beef hash, Strano Breads, homemade muffins, For the Little Ones Caterpillar Pancakes and specialties like Toad in the Hole over easy eggs grilled in the middle of a choice of bread with tomato slices , sandwiches, appetizers, soups, salads, build-your-own burgers, Lattes, specialty teas, hot or iced coffee, hot chocolate and Hosmer Mountain soda – the atmosphere here is warm and welcoming. One might say, it’s downright perky.